recruitment 2018 of Group B and Group C Posts. Online application link enable from 23-11-2018 to 22-12-2018. Computer Based test for this KPSC Maulana Azad Schools Teachers jobs will be held in the month of February 2019. Available subjects are Maths, Science, Social Science, Kannada Language, English Language, Urdu Language and Head Masters jobs. 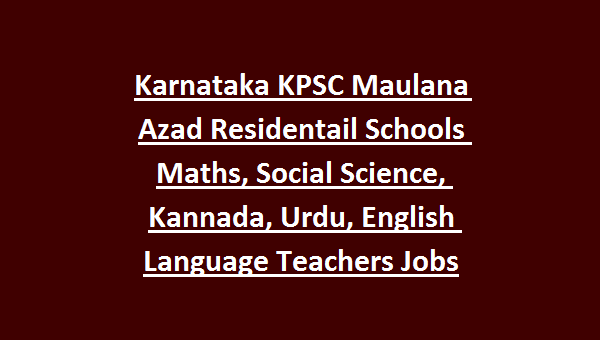 Written exam will be conducted for 200 marks for this KPSC Maulana Azad Schools Teachers Jobs. Exam Pattern and Syllabus, Selection Process, eligibility criteria and other details are given below for this Maulana Azad Model Schools of Karnataka State through KPSC recruitment 2018. There are total 700 vacancies are in this Karnataka Public Service Commission Maulana Azad Residential Schools Recruitment Notification 2018. For Cat 1, SC, ST candidates age limits are 18-40 years, For Cat 2a, Cat 2b, Cat 3a, Cat 3b age limits are 18-38 years and for General candidates 18-35 years. For Head Master jobs PG with B.Ed qualification is required. For RPC Vacancies written exam will be conducted for 400 marks. And for HK vacancies written exam will be conducted for 200 marks. Written exam will be held for 200 marks. 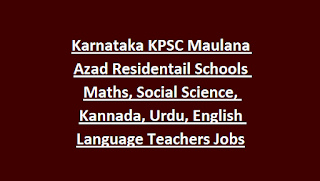 Apply online for this KPSC Maulana Azad Model Schools Teachers Recruitment before the closing date of 22-12-2018. Official website to apply online is www.kpsc.kar.nic.in. I didn't get admission card ..